If you have read this blog for very long, you know that I’m fascinated by fermented foods. They are really good for you, and I think things like fermented soda taste better than their store-bought counterparts. 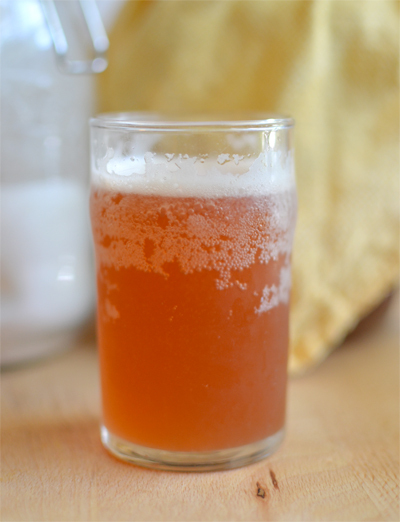 Jeth and I have been making kombucha, or fermented probiotic tea, for a while now. After a few months of trial and error, we’ve been able to get not only tasty, but really fizzy batches of kombucha “soda”. Kombucha is not at all hard to make, if you’ve got access to a health food store or website that sells the mother culture (also called a SCOBY: Symbiotic Culture Of Bacteria and Yeast), or a friend who has some to give away. 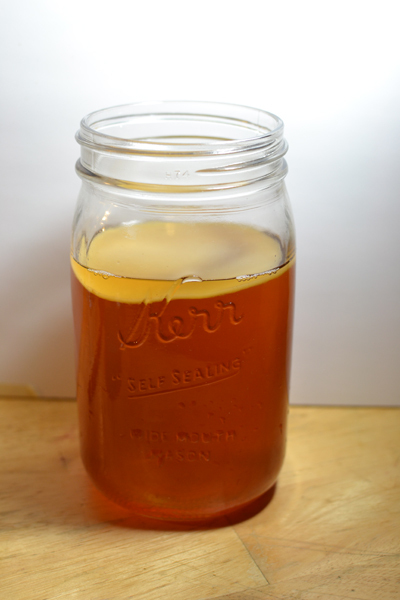 The basic idea is that this SCOBY – a whitish jelly-like disc made of cellulose, good bacteria, and good yeast – feeds on sugar in the tea and turns it into carbon dioxide and acetic acid. The first batch we made did exactly what it should – it turned a mason jar full of sweet tea into a less-sweet, kind-of-vinegary, lightly effervescent drink. If you have ever bought bottled kombucha, you know that “lightly effervescent” doesn’t really describe the amount of carbonation you’ll find in commercial kombucha. That’s where it gets a little trickier. 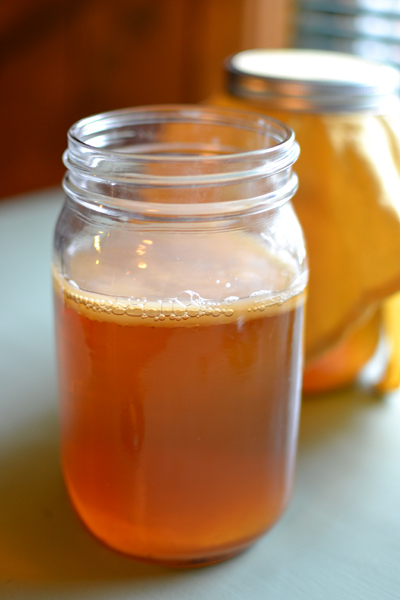 Kombucha fermenting is an aerobic process – the scoby needs air to grow and ferment your sweet tea. A second fermentation in sealed containers (much like making fermented ginger ale) allows the CO2 produced by further fermentation to be trapped inside the drink, making for a much fizzier drink. I had a really hard time finding reliable second-fermentation instructions, so I’ll share what’s been working for us. I documented the making process of a recent batch, if you’re new to kombucha making and want to see how it’s done. Second fermentation instructions are near the end, if you’re just looking for those. I know this post looks long, but it’s only because I’ve got lots of pictures and explanations. It really is a simple process. 2-3 plain black tea bags (decaf is fine, but stay away from anything flavored, even if it’s “naturally” flavored). Starter liquid: 1/4 c. to 1/2 c. leftover kombucha from an old batch (some purchased scoby-s will come packed in starter liquid), or you can always buy a bottle of plain unflavored kombucha from health food stores to use as starter. I like to use quart-sized mason jars, since it’s easy to see what is happening with the kombucha, and they are easy to cover (more on that later). 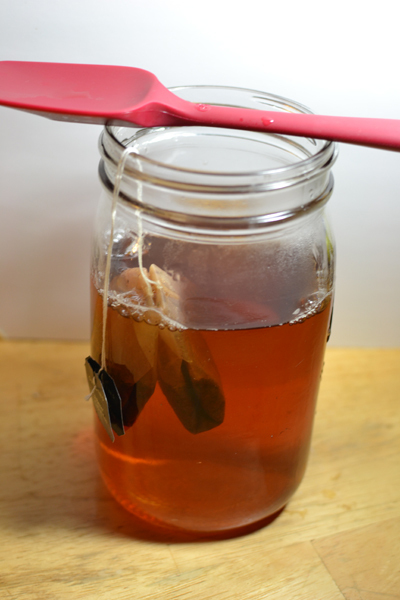 Drop your tea bags into the bottom of the mason jar and add about a cup of boiling water, plus the 1/4 c. sugar, stirring until the sugar dissolves. Let this sit for 10-15 minutes (or however long it takes to remember you’ve started this project, if you’re anything like me, ha). Pull the teabags out and add cool water until you have 3 1/2 cups of sweetened tea. To the tea, add your starter liquid and the scoby. In the picture below, you can see the thin scoby floating on top. Yours might sink, and that’s okay. Cover the jar with a thin cloth (like doubled-up cheesecloth) or paper towel, and screw on the “band” part of the lid to keep everything in place. Leave the jar in a semi-warm (70-80°F) place out of direct light, where it won’t be disturbed. After about a week, it will have grown a new scoby over the surface of the tea. You cans see in the picture below that the original scoby is laying in the bottom, and the new “baby” scoby is floating. Sometimes the original will keep floating, and the new one will fuse to it. I’ve got one scoby that is 5 or 6 layers thick, since I’ve never bothered separating them when they fuse. After the week is up, give it a taste: is it still sweet? A little vinegary? Really tart (it probably won’t be at this point, but who knows…). If you like how it tastes, which is totally a matter of personal preference, you can drink the tea as it is, or start the second fermentation. If you want your finished kombucha to be more sour, let it go for up to a couple more weeks. You can use the scobys to start new batches of tea, or give them to friends. If you don’t want to deal with them right away, just store them in a cloth-covered jar with enough old kombucha to cover them so they stay hydrated and fed. They’ll keep this way for a couple of weeks. 1/4 c. 100% fruit juice. So far my favorite has been a cranberry/blackberry/blueberry blend – Ocean Spray, I think. Clean swing-top bottles (we use saved Grolsch bottles) or a clean 1-liter screw-top soda bottle. Make sure you choose something that will seal really well. Pour the tea into your clean container(s) and add the juice. Let them sit at room temperature (again, 70-80° is good, but we left some in a warm car during vacation and they turned out great) for at least 7-10 days while they carbonate. The first time you try a second fermentation, I’d use a plastic bottle so that you can feel the pressure building as the tea gets more carbonated. Once you know how long it takes in the temperature of your home, switch to glass. This will avoid the potential for shattering bottles from accidentally over-carbonated kombucha. Once you are happy with the carbonation level, move the bottles to the fridge, where they’ll keep happily for a few weeks (probably more, but we always drink ours before then!). Tags: dairy free, drink, fermentation, gluten free, recipe, snack, vegan, vegetarian. Bookmark the permalink.